New York University Press, 9780814707111, 245pp. Popularized in the movies Erin Brockovich and A Civil Action, "environmental justice" refers to any local response to a threat against community health. 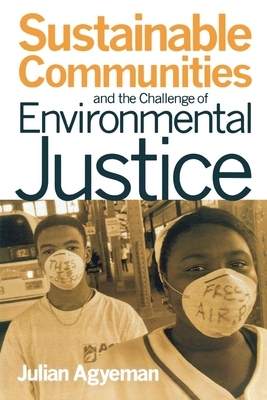 In this book, Julian Agyeman argues that environmental justice and the sustainable communities movement are compatible in practical ways. Yet sustainability, which focuses on meeting our needs today while not compromising the ability of our successors to meet their needs, has not always partnered with the challenges of environmental justice. Sustainable Communities and the Challenge of Environmental Justice explores the ideological differences between these two groups and shows how they can work together. Agyeman provides concrete examples of potential model organizations that employ the types of strategies he advocates. This book is vital to the efforts of community organizers, policymakers, and everyone interested in a better environment and community health. Julian Agyeman is Professor and Chair of Urban and Environmental Policy and Planning at Tufts University. He is the co-editor of Local Environment: The International Journal of Justice and Sustainability and Just Sustainabilities: Development in an Unequal World. Visit his blog at julianagyeman.com.